MEV have developed an Excel Add-In for the AMPLICON PCI230 and PCI260 Multifunction Analogue I/O Boards. 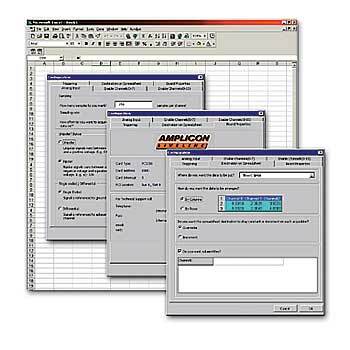 The DAQ software supports Amplicon PCI230+ and PCI260+ analog input cards. The software can be used with a Windows PC with Microsoft Excel 97 onwards. It is based on custom 32 bit Active X controls that allow excel to easily configure / interface to the analogue data acquisition hardware. The components are fully compatible with other development environments such as Microsoft Visual Basic, C++ and Delphi.